For about a month, leaving work around rush hour for hundreds of commuters in Newton, Massachusetts, - including our co-workers at necn - has been a bad episode of Trapped on Wells Avenue. 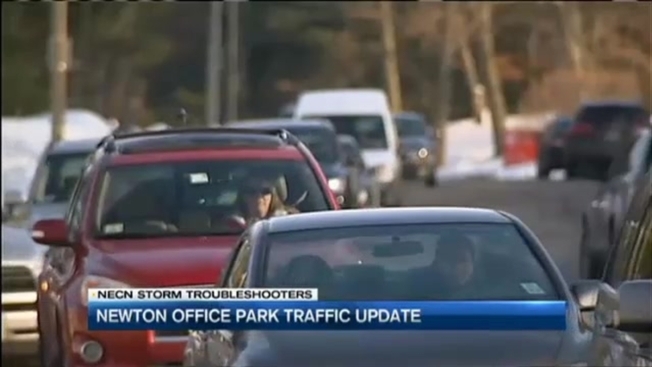 We first told you last week about the backup of in some cases a full hour just to get out of the 3/4 of a mile office park loop. Since then, several steps have been put in place or are in the works by Needham, Newton, or the state. For starters, there has been extensive removal of snow in the office park, plus in and around the construction site on the Kendrick St. bridge in Needham. The traffic light at that corner has been adjusted, the turning arrow will now be before the regular green light. The bridge over the Charles River on Nahanton Street will now have three designated lanes as two left tuning lanes leave the Wells Avenue park. Even officials know, this is remediation, not a perfect fix. "Do I think it will it will solve the problem? I think it will alleviate the problem to some degree. We try to figure this out and try to take steps that are in a positive manner, see how they work, and plan to make changes accordingly," said John Bulian, Chairman of the Needham Board of Selectmen. "It's going to be a painful couple of years before those ramps come online. But by the fall 2016, you'll be able to leave Needham go south directly from the park and be able to come into the park from the south. So, that really is the eyes on the prize and that we're really going to hope to make the situation a lot better," said Needham Town Manager Kate Fitzpatrick. Needham said the state was going to make westbound lanes over Kendrick street into two lanes, one eastbound down the hill. The state now says that is not happening, at least for now.